NEW YORK, Dec. 2, 2014 – Welcome to 2034. What’s your future self wondering? Perhaps how people live and what lifestyles have become the norm? What individual rooms in homes look like and what functions they now serve? Two innovative companies, leading sanitary fittings manufacturer GROHE, and ceramics maker Villeroy & Boch along with the cooperation of Zukunftsinstitut, the influential Frankfurt-based think tank led by futurist Matthias Horx, conducted a study to determine what the bathroom in particular might evolve into by 2034. The result was four futuristic bathrooms scenarios that were derived from an online survey of a representative group of 1,075 respondents as well as an analysis of current international mega trends and social developments. Each of the four models brings an essential aspect of the bathroom into sharp focus. The new GrohTherm® 2000 is a modern solution for the bathtub and the shower, combining all advantages of a thermostat with a perfect water experience. According to the survey, most people (60 percent) want a bathroom that meets the needs and expectations of everybody living in the household. Today, innovations like the new GrohTherm 2000 thermostat with GROHE TurboStat® technology brings users their desired water temperature in seconds. By 2034, smart home technology will make this easy to achieve without compromising on individual convenience. As soon as a user enters a bathroom, all elements will adjust automatically to his or her favorite settings – from the room temperature to music and colored lighting, from the height of the sink and toilet bowl to their preferred surfaces such as wood, stone or tiles – all of which will be able to be projected onto screens with a high degree of realism. The Healthful Bathroom: The bathroom as a central point of personalized health management, where users actively check in on their physical well-being. The Multi-ID Bathroom will also allow for the variability of individual fittings and furniture: the bathtub doubling as a seating area, the sink becoming a makeup studio and the mirror turning into a news screen. Depending on which user is present in the room at the time, certain elements can disappear behind the wall or rise up from the floor. In addition, many fittings will be multifunctional, with the hand shower dispensing not only water but also shampoo, or the shower doubling as a full-body drier, obviating the need for a towel. The Multi-ID Bathroom will also be available in semi-public environments like hotels or offices. Everybody will be able to activate their personal bathroom settings anywhere, immediately feeling at ease even when stepping into a bathroom away from home. This will be made possible by cloud-based technologies and the ability of many products to store select features and settings. Bathroom products incorporating digital technology are already a reality. GROHE SPA® F-digital products, for instance, give users fingertip access to their favorite shower temperature or preset water delivery programs at the sink. Touching the pause button suspends the flow of water, perfect for shampooing. Once stored, a setting can be repeated with the utmost precision time and time again. The perfect solution for a personalized bathroom experience available today, GROHE SPA® F-digital products provide fingertip access to favorite shower temperatures or preset water delivery programs at the sink. Almost half of the people surveyed would like to have a bathroom with health-oriented features. By 2034, the bathroom will become a central point of personalized health management, where users actively check in on their physical well-being. Various elements installed throughout the bathroom will enable this. They will measure bodily functions and collect vital data that is then fed back to the user. The toilet will analyze urine, the toothbrush will collect information from saliva and even blood readings will be able to be taken in full comfort using non-invasive methods. The bathroom can also assume the function of a fitness center. An on-screen avatar will motivate us to do certain exercises by demonstrating the routines and awarding us digital badges when we accomplish specific goals. Motivational tunes and even cheers will put a virtual personal trainer in our bathroom. In addition, the bathroom’s function as a health center will be complemented by web-based technologies that provide online access to the nearest pharmacy, live chats with doctors and recommendations of the best restaurants for healthy and balanced meals. The bathroom of the future will assist our personal preventative healthcare efforts at a professional level, helping us to feel fit and healthy for longer. The Zero Emissions Bathroom where the space has a positive environmental impact and utilizes natural materials. Whether it is because of cost considerations or out of concern for the environment, 75 percent of survey respondents consider energy efficiency to be an important aspect when it comes to bathroom remodelling. With environmental awareness continuing to drive improvements in resource efficiency, bathrooms will have a positive environmental impact by 2034. This means that they will work autonomously and in an energy-neutral way. Engineered as self-contained modules for housing construction, they will no longer depend on connection to the public water and energy networks. “Neo ecology” is already one of the most important mega trends. Sustainability and resource efficiency are a serious topic in public debate already, as we know, and will be taken for granted in daily life 20 years from now. Designed as a small power station in its own right, the Zero Emissions Bathroom will function as a heat recuperator and water treatment facility, for example, by converting wastewater into methane which is then used to generate heat. Actual sewage will be minimized by vacuum toilet technology. This sustainable mind-set will also be reflected in bathroom design and decor. Natural materials such as wood and clay that are not only hygienic, but also non-toxic and compostable, will make a big comeback. This trend is already evident today, with 63 percent of people appreciating stone, wood and bio-textiles in the bathroom. By the year 2034, these preferences will lead to a design philosophy that elegantly blends sustainability and luxury, ecology and innovation. At GROHE today, sustainability is a core value prevalent in each stage of product manufacturing and design innovation. For example, all GROHE EcoJoy™ products are systematically designed to save water and energy so that precious resources are conserved. EcoJoy tehcnology reduces water consumption by up to 50 percent and products equipped with it offer the perfect water experience without the need to compromise. The Personal Time Bathroom fulfils the wish of a large majority, 71 percent of respondents, for a room devoted to relaxation and “me time.” Designed and equipped as a hyper-modern private spa, the bathroom of 2034 helps its users replenish their energy levels and achieve a balance between mind, body and soul. This experience is akin to seeing a feature film in a modern 3D theatre. Using audio equipment, mood lighting, aromatherapy and scenic backdrops projected onto the walls, the bathroom takes users on a journey to a different world. Whether it is in the steam bath or in the hydro-massage tub, your body is being pampered and your mind is free to roam. Rather than merely providing a place for passive relaxation, the Personal Time Bathroom places an emphasis on inner growth through meditative experiences and seeks to leverage the therapeutic effects of virtual realities. A variety of digital themes can be selected to convert the room into a yoga studio or a spa lounge and a whole variety of different functions can be programmed to align with users’ biorhythms. An en-suite floor plan allows the Personal Time Bathroom to extend its healing atmosphere into the bedroom, contributing to restful sleep. Just as people’s paths through life are becoming less linear and more multifaceted, the future of the bathroom cannot simply be predicted along straight lines extrapolated from a variety of present-day trends. 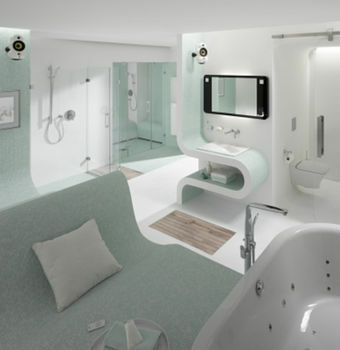 This means that the actual bathroom of the future will probably be a hybrid of the bathroom universes outlined above. Multifunctionality will be key as the bathroom adapts to users’ evolving lifestyles and tomorrow’s flowing transition between living and working. Whatever is to come in the bathroom, GROHE is ready to meet the challenge. The GROHE Group was purchased by the LIXIL Group and the Development Bank of Japan in January 2014. The LIXIL Group is the global leader in the building materials and housing equipment industry. GROHE and Joyou remain independent within the LIXIL Group. 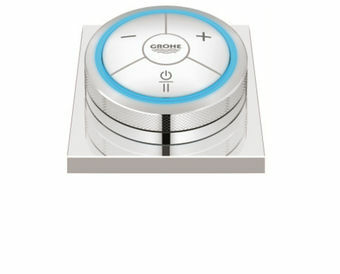 For more information and to find local showooms, please visit www.grohe.com/us. or call 1-800-44-GROHE (47643).